Fan; 3.15 in. L x 3.15 in. W; 0.984 in. ; 12 VDC; 40 CFM (Max. ); 33 dB; Ball Fan; 3.15 in. L x 3.15 in. W; 0.984 in. ; 24 VDC; 32 CFM (Max. 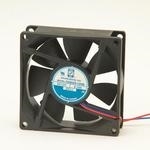 ); 27 dB; Ball Fan, DC; Radial; 12 VDC; 0.29 A; 33 dB; Ball; 50 CFM; Wire Leaded; 0.24 in.